Are you wondering what benefits sensory play has for your baby or toddler? You might want to know what you can do or buy to help them develop. 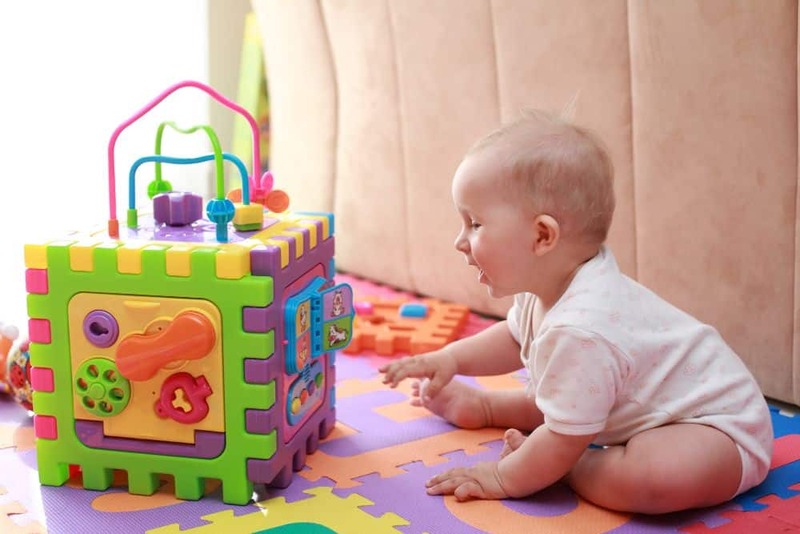 This guide to the best sensory toys for babies and toddlers can give you some ideas. Before I had children, I had heard of sensory play but not being a mom I hadn’t really paid much attention. To me, toys were toys and kids played with them. Now that’s all changed and I am a lot more aware of which toys are fun but also beneficial to my baby’s development. Let’s take a look at what sensory toys are and our top picks for your babies and toddlers. Use the links above to check the latest prices or read our in-depth sensory toy reviews below. Sensory play helps to develop your child’s five senses: touch, hearing, sight, taste, and smell. Babies and toddlers love to explore their new world and are constantly learning new things. Sensory play aids this while also being fun (source). Building nerve connections in the brain. Encouraging the development of fine motor skills. Encouraging problem solving and scientific thinking. Not only do kids benefit from sensory play, but it’s also an opportunity for you to spend some quality time with them. I find it fascinating and amazing how quickly they pick up new skills. I love to watch their little expressions when they find new things to explore. Think about each of the five senses and choose toys that captivate each one. Sight: Look for toys that are brightly colored or have contrasting colors and designs. These will be visually interesting for your child. Also, think about things like beads within a toy, which move to catch their attention. Touch: Different textures will encourage them to explore, whether this is with their hands or mouths. Find things that crinkle or have raised or soft textures that tiny hands can feel. Different materials will be fun for a baby or toddler to touch and discover. Sound: This could be the noise of a rattle, different sounds, or music. Toys that have beads in them that make noise when shaken are ideal. Those that make a noise or play music when squeezed, or when buttons are pressed, will also encourage sensory play and engage your child. Taste: Babies use their mouths to explore tastes and textures. Consider teething toys with different textures and shapes. Just make sure they’re free of all toxins and are kept clean to keep baby safe. Smell: Toys infused with smells tend to be aimed at older children. However, even for a baby or toddler, different fabrics and materials will smell different. Vary the materials of their toys, to include things like plastics, fabric, and wood. We use our senses to engage with the world around us and, for babies and toddlers, this is magnified as they develop and have their first sensorial experiences. 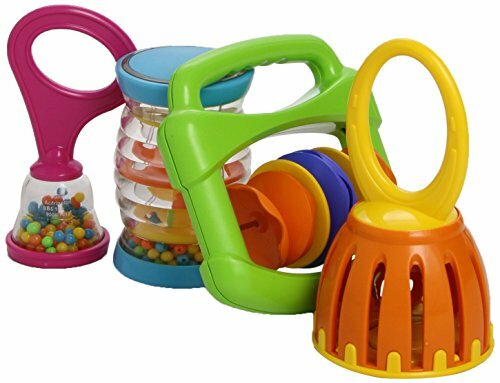 Here are our top 17 picks of the best sensory toys for babies and toddlers. 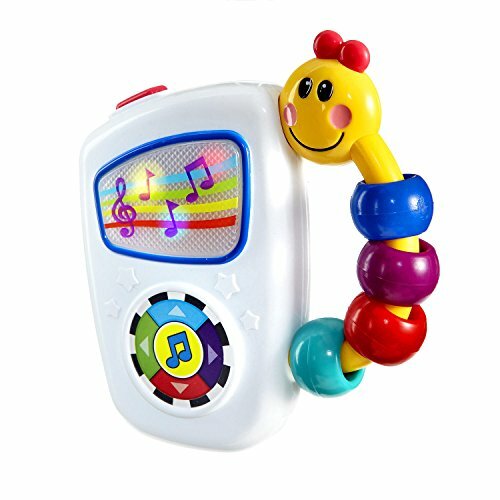 This toy will be music to the ears of your babies and toddlers, and to moms when they find out it has volume control. The cute caterpillar handle has brightly-colored spinning beads and is easy for babies aged 3 months and older to hold. Large buttons are easy to press, and lights moving with the rhythm attract baby’s eyes. I like that the tunes this toy plays include Mozart, Chopin, and Vivaldi. It makes a pleasant change from nursery rhymes, and introduces the classics to your child. Remember the stacking toys you played with as a kid? This one is a spin on those, literally. We might be a bit envious. Colorful, daisy or star-shaped discs are placed on a pole that has a spiral along the outside. Kids love watching them twist their way down the pole, then removing the base and seeing them tumble off. It helps 1-year-olds and above with hand-eye coordination. The tactile discs and movement encourage sensory play. 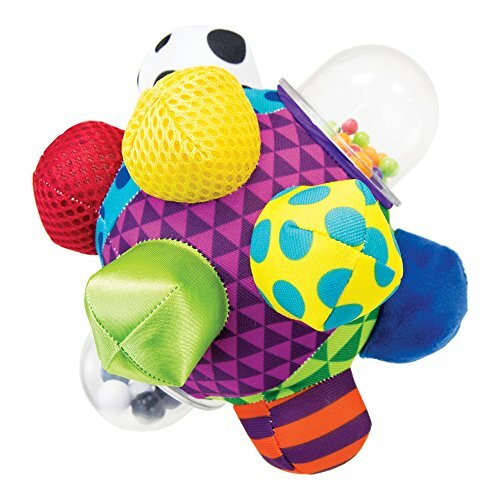 Suitable from 6 months, this ball has lots of different textures, patterns, and colors. The chunky bumps on the ball make it easy to grasp and hold. Shake it or move it from hand to hand, and hear the gentle rattle noise it makes. 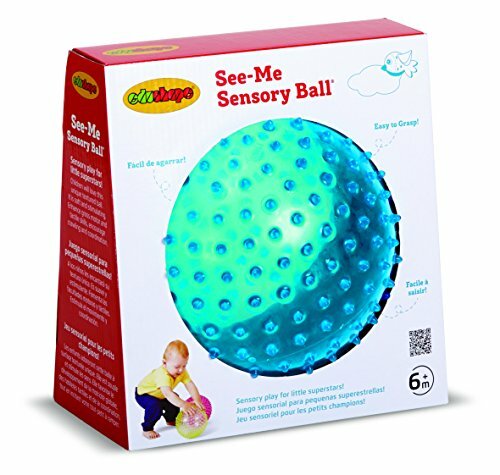 We like that this ball incorporates sensory play for sight, hearing, and touch. 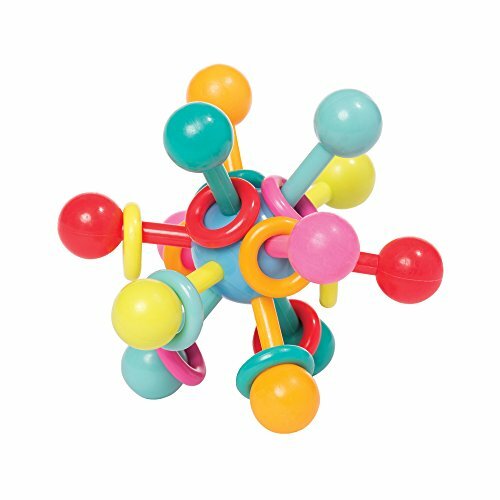 This unusually-shaped rattle has lots of small nodules at the end of the teething stems, encouraging your little one to grasp it. Rings are incorporated on the soft stems, which can be moved back and forth, developing fine motor skills. The bright colors will attract your child’s attention. Suitable from birth, the rattle is PVC and BPA-free, so is safe for those exploring with their little mouths and hands. 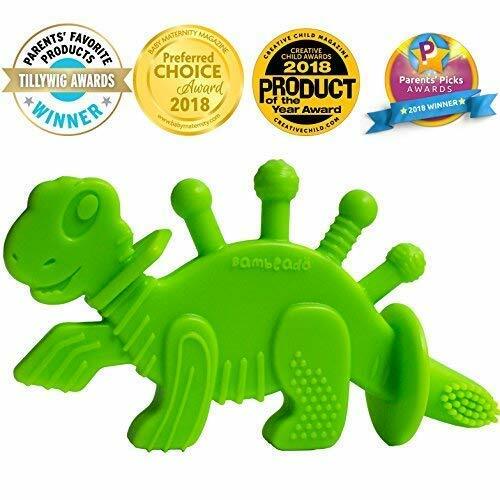 This adorable dinosaur teether and toy will delight babies from 3 months onwards. You can choose from three bright colors: green, cyan or orange. Apart from helping when teething, the different textures and shapes will be easy to hold and fun to explore. The toy also comes with a 32-page book, telling the story of Dibley the Dino. This is great for some mom and baby time, reading and relaxing. This four-piece musical set for babies aged 3 months and over will provide hours of fun. There’s a mini tube shaker, a baby maraca, a cage bell, and a baby rattle, which all store in a strong vinyl bag. It’s great that some of these mini-instruments are transparent, so little eyes can watch the brightly-colored beads inside as they play. This colorful elephant offers lots of sensory fun. It has a mirror, crinkly ears, different textures and patterns, a rattle, and a teething ring. 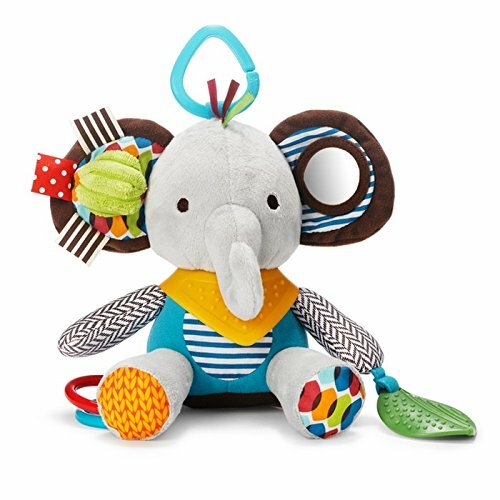 Little ones over 3 months old will enjoy having this elephant as their playtime buddy. A great feature about this toy is that it can be attached to a stroller for on-the-go fun without getting lost. 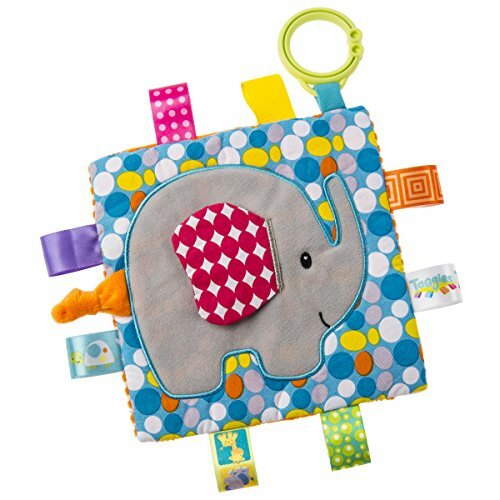 This fabric square has a crinkly paper on the inside and a squeaker, with eight different tags that a baby can explore. We think it’s suitable from around 3 months old, although an age range isn’t specified. You can choose from 12 different animals on squares, such as a cute owl or fox. Each one has a teething ring and the tags all have a different feel to them. My little ones loved playing with tags and labels, so this is a good toy if yours does too. Best part? It’s fully machine washable, just pop it in a mesh bag. 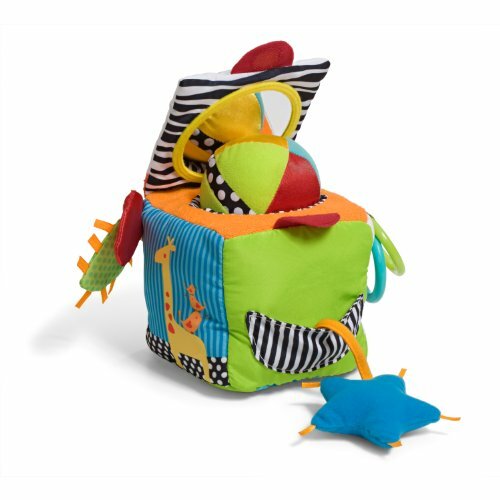 This lovely brightly colored and textured fabric cube has some hidden surprises for your baby to discover. These include clacker rings, crinkle fabric, and a mirror. There are things like a star that baby can put in and out of a pocket, and a ball that can be popped in and out of the middle. Infantino has covered all the bases with this toy, attaching the removable parts with a ribbon so they don’t get lost. Babies over 3 months old will find this toy engrossing. Activity mats are great tools to have in your arsenal of sensory toys. This one incorporates 18 different activities, including a mirror, lights, sounds, and textured fabric. 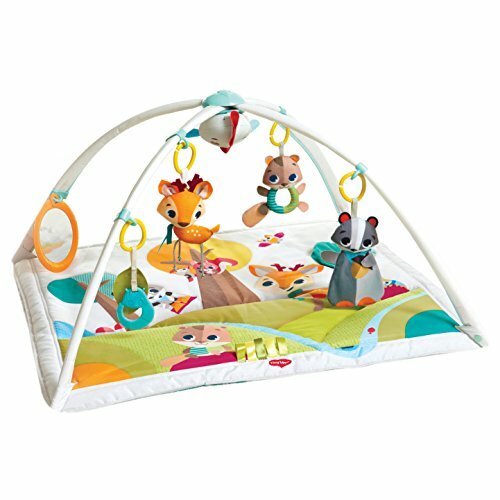 It’s great for tummy time or lying and exploring toys that hang from the adjustable arches. The mat pad is also machine washable and packs away easily for storage, plus you have four themes to choose from and three different sizes. This mat is suitable from birth. What little kid doesn’t love water play? But what mom wants to clean up the mess? This BPA-free mat gives you the best of both worlds. 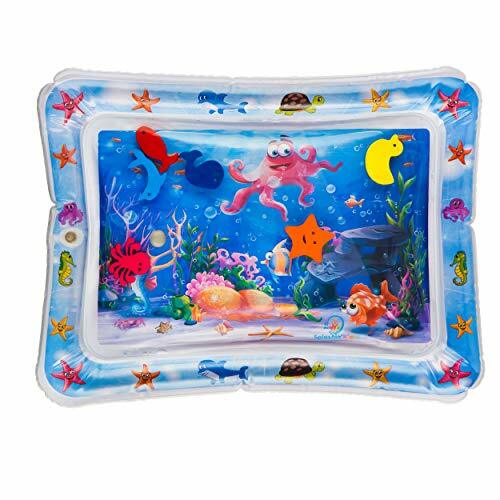 Fill the outside with air and the center with water, and let your baby have tummy time playing with the delightful fish floating in the middle. The colorful seascape in the background and sea creatures on the side provide more to explore. Constructed from heavy-duty PVC, the manufacturer guarantees this won’t leak, or you get a refund. For babies aged 3 months and over. These six brightly colored balls each have a different texture. There are bumps, ridges, nodules, and dents for baby to explore. These balls are just the right size to encourage tactile play for babies 6 months and over. The balls are also BPA-free, making them a safe choice for your child. 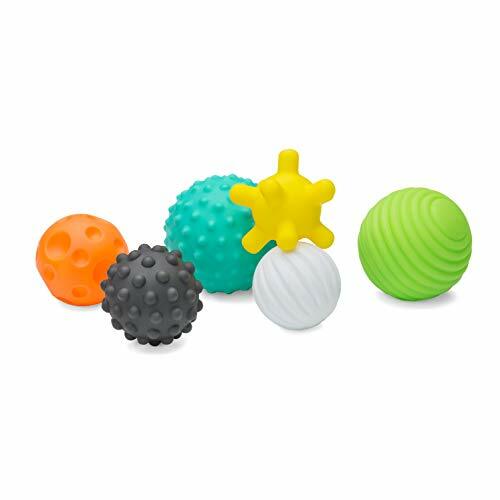 This 7-inch sensory ball has a knobbly texture making it easy for little ones older than 6 months to pick up. They’ll love the soft squishy rubber texture, which contracts and expands as they squeeze and pull the ball. There are four different color options and even one that glows in the dark. Moms can rest assured, however, that the ball is phthalate-free. 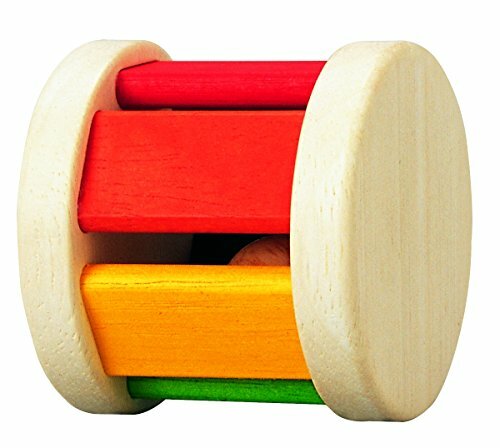 Brightly colored wooden slats enclose a ball inside this rattle-and-roll toy. It will stimulate your baby’s vision and they’ll love the noise it makes as they roll the cylinder along the floor. Suitable for children 6 months and over, the paints and wood are safe and sustainable. The PlanToys company has a great reputation for producing non-toxic, recyclable toys. 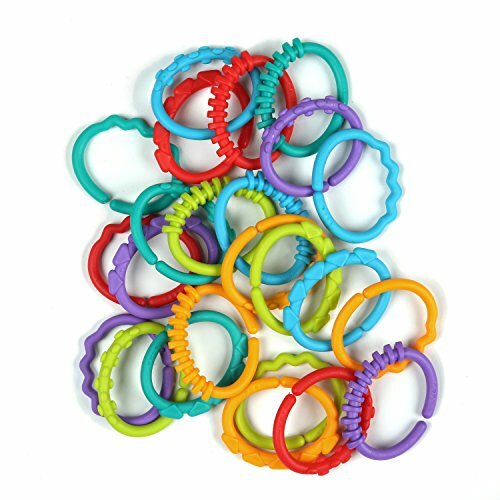 Good for babies, toddlers, and moms, these interlocking BPA-free plastic links serve more than one purpose. Kids can squish them, bend them and delight in the ribbed texture. Moms can use them to secure baby’s toys to a stroller, high chair, or shopping cart to prevent them from getting lost. The good news is there are 24 of them, plenty for moms and kids up to 3 years old. This non-toxic modeling material has been a favorite for over 50 years. It’s tactile and brightly colored, and inspires little artists to mold and create. 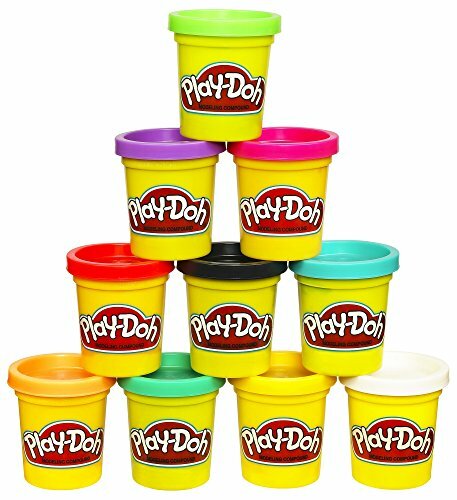 Pliable and squishy, tots older than 2 years will have hours of sensory fun with this Play-Doh set, which includes 10 small tubs in assorted colors. 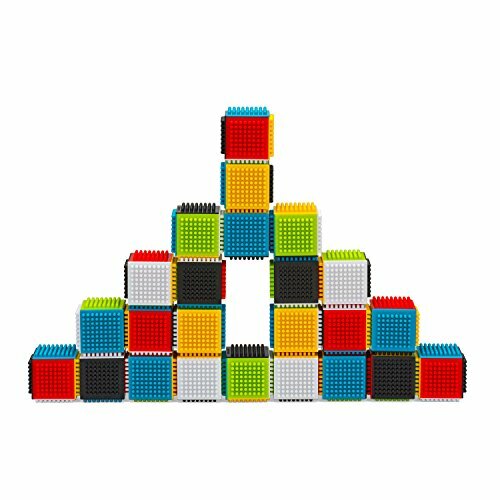 Kids love to build, and these textured, multicolored blocks make it easy and fun. They slot together on their nubbed ends or sides, without even having to be lined up properly. Babies and toddlers older than 6 months will be creating their own towers in no time. I like that these 24 bricks allow kids to be creative while providing tactile and visual stimulus. Sensory play helps your little ones explore and learn about the world around them. It encourages the development of their five senses in a fun way. Of the toys we have chosen, my favorite is the Baby Einstein musical toy. It provides the stimulation of sight, sound, and touch. It’s small and portable so can go anywhere with you. 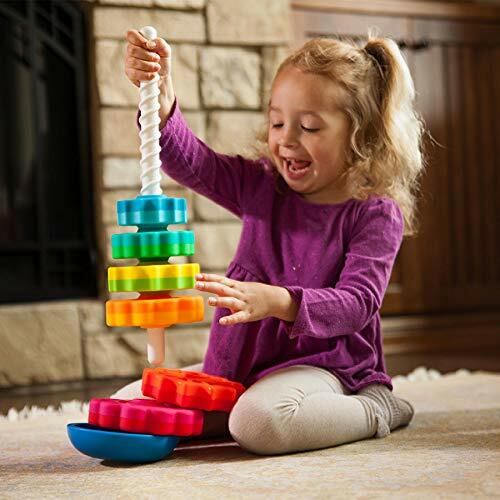 We hope you enjoyed our lineup of the best sensory toys for babies and toddlers, and found a favorite for your child. Please leave us a comment, and don’t forget to share with other moms.